At first glance, one might think that Katy Perry and Zooey Deschanel are one and the same person, but this is definitely no Hannah Montana case wherein one assumes two roles. Katy Perry is not Zooey Deschanel. They may only look alike, but while one is a musician, the other is more of an actress doubling as a singer. Born Katheryn Elizabeth Hudson, Katy Perry started her music career singing predominantly gospel songs. That wasn't surprising considering that Perry grew up in a Christian-based environment. Her initial gospel style didn't gain much public appreciation, so for her second album Perry’s style and choice of songs were anything but. She changed her style to pop and rock and her second album became a huge success. Perry’s voice is on the contralto vocal range. Some artists that are said to have played an influence on her style include Alanis Morisette, Cyndi Lauper, Joan Jett and Shirley Manson. Zooey Claire Deschanel is an American actress, singer and songwriter. Singing just comes naturally for her. She sings in the cabaret and has a penchant for everything vintage. Her voice is described as soft, smokey and wispy. Among Perry’s greatest hits were ‘One Of The Boys’, ‘I Kissed A Girl’, ‘Ur So Gay’, ‘Waking Up In Vegas’, ‘Mannequin’, ‘Hot and Cold’, and ‘I’m Still Breathing’. Deschanel, on the other hand, is best known for ‘She and Him’, an Indie folk song, which she sang together with M. Ward. Deschanel is known to have a great singing voice but it is in the area of acting where she excels. Perry has won several awards, among which International Female Solo Artist, and New Act. She has also won nominations as Best Selling Female Music Video for her song ‘I Kissed A Girl’, World’s Best Selling Pop/Rock Female Artist, Best New Artist, and a Grammy nomination as Best Female Pop Vocal Performer. Zooey won a Best Actress award during the Mar del Plata Film Festival for her portrayal in the movie ‘All The Real Girls’ in 2003, and earned nominations as Best Female Lead and Best Actress for her roles in ‘All The Real Girls’ and ‘500 Days of Summer’. Musicality and Style – Perry’s style has evolved into modern pop and rock, while Zooey’s more of the jazz type. 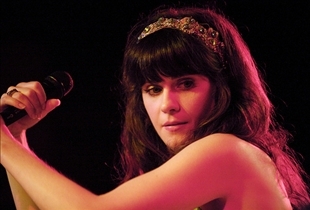 Greatest hits – Perry has a string of songs to her name, including ‘One of the Boys’ and ‘I Kissed A Girl’ while Zooey’s best known as the other singer of the Indie folk song ‘She and Him’. Awards – Perry has received various awards in music, including a Grammy nomination as Best Female Pop Vocal Performer, while Zooey’s awards and nominations were due to her performances as an actress. These included a Best Actress Award in 2003 for the movie ‘All The Real Girls’. Which celebrity wears better fashions? Maybe when you look at their face you will say "omg they look the same!" but in these pictures, you can see that Zooey has fairer skin than Katy and also Zooey's eyes are much bluish than Katy. I don't know why but I can distinguish if it is Zooey or Katy by looking in their eyes. Katy is a big idiot... In the People's choice awards, she is talking about how heavy her two awards are! Actually she is talking about her ****. Some of this is wrong. For instance, Zooey sings in the duo She & Him - it's not a song. You could put 'In the Sun' or 'Why Do You Let Me Stay Here?'. Katy's could do with updating too, she's had another string of hits with her second album - which is doing better than her first. Kind of biased against Katy too. How come she gets to be 'Zooey', but Katy is 'Perry'? Why does Zooey get vocal compliments, but Katy's achievements are just stated? The rest looks great, though. Not slating it. Zooey has some kind of incredible beauty I've never seen in someone before, she's like the kind of girl you could get lost with looking into the eyes of forever and ever. Katy is extremely hot, I think she's actually sexier than Zooey, but it still just doesn't compare - Zooey has something special about her.